It’s turned into one of those days. A day off that you hope will turn out sunny. It starts misty and cool but you convince yourself that ‘the sun might just burn through’ and you’ll be able to get out into the garden and plant something, or walk the dog, or just get up off the sofa and wash the pots. It’s not going to happen. The day is going to continue teasing with a glint of sunshine, then laughing as it throws in a cold wind and a hair-frizzing shower. I may as well give up and accept it’s an inside day. Ed is already holed up in the workshop, coffee in hand, radio on, with some wooden panelling to make. We found woodworm you see. The tiny black dots on the painted wooden panels around our bay window weren’t fly poo, they were woodworm holes. So in a frenzy of activity one Sunday afternoon Ed ripped the whole blimmin lot out. So now we have a bare brick wall and Ed has a new project: Panel building. It’s taking him longer than usual as he’s decided to go all retro and cut all his mortises and tenons by hand instead of using the plethora of machines that he has collected over the years. He’s decided it’s more fulfilling and life enriching. I however am a lazy arse. I have decided that writing this is a good way to try out my new reading glasses. 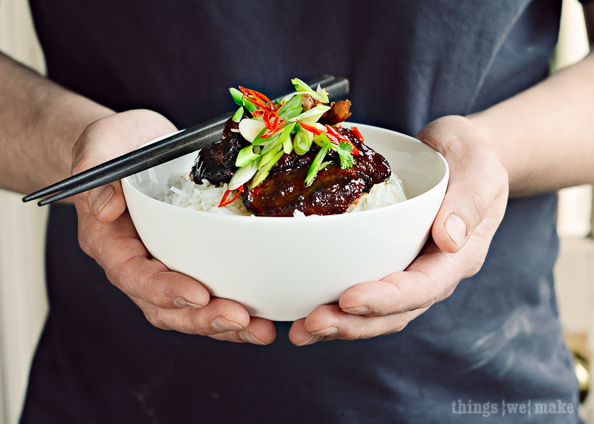 I have also decided that tonight we shall have sticky chinese pork. This means that I can justify bashing something with a hammer later, then I have to bimble around the house while it cooks and I don’t have to do any chopping. I don’t feel the need to enrich my life with hand-cutting anything. This is the sort of thing I make when I know I am going to be around at home in the afternoon but don’t want anything too involved. It uses a cheap, boneless cut of meat and just a few ingredients which the slow-cooking turns it into something warming and tasty. It’s photographed in the new ‘China’ range from Denby. Don’t be tempted to do this with loin or another ‘better’ cut of meat, it will be too lean and dry. Spare rib chops are a cheap-ish boneless steak of pork that has fat running through it – this style of cooking melts the fat. You don’t always see it in supermarkets but butchers should sell it. Morrison’s call them Pork Shoulder Steaks and sell them for next to nothing. Preheat the oven to 170°c (about 340°f) Total cooking time – 3 hrs. On a chopping board hammer the chops well, especially any fat, with the pointy end of a meat hammer until they are twice as big and half as thick. Put the chops into a lidded casserole dish. I use a Pyrex one so I can keep an eye on it. Pour over the olive oil, soy sauce and squeeze over the orange juice. Give it a bit of a stir around. After 2 hours add 1 tablespoon of honey and 4 tablespoons of sweet chilli sauce. Cook for another ½ an hour with the lid on. 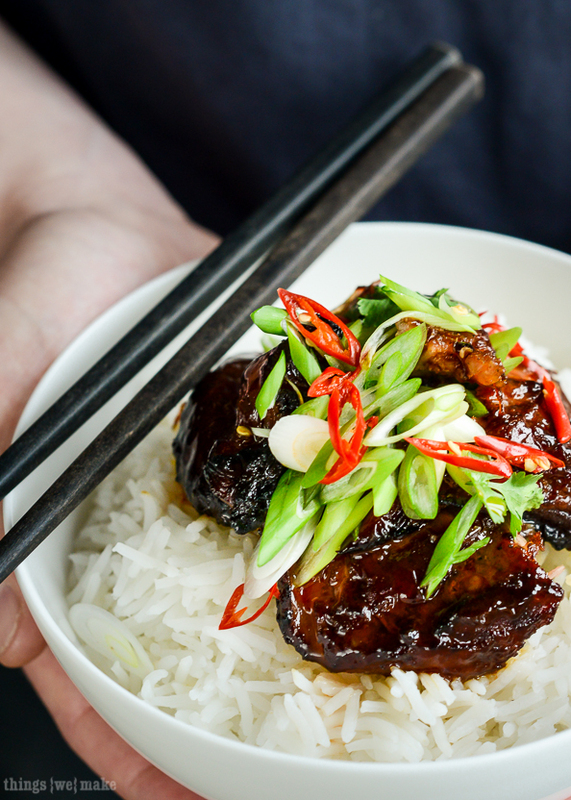 Serve with boiled rice, some chopped spring onions and chilli plus extra sweet chilli sauce.